The weather here in Sarasota has transitioned to its fall period with the morning temperatures in the cool 50’s followed by comfortable afternoons in the 70’s. The skies are a soft celeste and there is no wind to speak of other than a welcome afternoon breeze. Ideal weather to ride a motorcycle. No more having to leave at dawn to avoid the heat, no more dripping sweat at every stoplight, and no more sequestering yourself indoors during most of the day to avoid riding in an inferno. As I said, the ideal weather has finally arrived. Today ride turned out to be a quick commute to the motorcycle shop to pick up a jacket liner for the cooler weather and replace my windshield which has sustained some scratches from my crossing-my-wheels several weeks back. On the way home I stopped for an early lunch at a burger joint. While eating I realized this is how many riders experience being on their motorcycle — commuting around town, brief stints with stop-and-go traffic and generally little Zen-inspired riding. I cannot say it was unpleasant, in fact it was just the opposite. I dropped into a routine riding mode and found my mind drifting to random topics as I looked around. It felt like driving a car, a generally relaxing experience for me. If this was the only kind of motorcycling I ever did, however, it would be unfortunate: the motorcycling itself simply recedes from your conscious experience. I did however have a 15-minute period of sustained riding that dropped me into a spontaneous contemplative mood. At such times I tend to observe my state of awareness and this time I saw my attention, both conscious and preconscious, was centered not only in the moment but in the future as well. This is as it should be. From the beginning of motorcycle safety class you are relentlessly told to look where you are going to be, not where you are. Many beginning riders, anxious about falling, have a tendency to look where they are, right in front of them, rather than where they are going, down the road. When anxious your focus stays too much in the moment and your sphere of attention drawn too tight from a safety point of view. The faster you are moving, the further down the road you need to be looking, an ironic cruelty for such anxious riders. Reflecting on this, I visualized a four-dimensional sphere of spacetime surrounding me. If indeed one where fully in a here-and zero dimensional now Zen moment, the sphere would collapse into a point. What we actually experience, however, is not a zero-dimentional point but a four-dimensional volume. This Spacetime Sphere of Awareness is an concept we create so events across past present and future can interact within our mind. Without our capacity to create this sphere and the interactions across it, we would be trapped within a concrete here-and-now moment and not be able to have An Experience with structure with self-interacting qualities. Heady stuff, yes, I know. And what had this practically got to do with riding anyway? Maybe nothing, though I’ve learned to sleep on such thoughts since they return of their own accord if there is more to them. The next day I went for what was to be a plesant four-hour ride to Key Vista Nature Park about 75 miles north from my home as the crow flies, apparently with a great view of the Gulf of Mexico and rich in birds and turtles: a promising photography location. An hour into the ride, the Spacetime Sphere of Awareness did indeed return, this time with a riding problem I’ve had for some time in tow: forgetting to turn off the turn signal after a turn. Despite a concerted effort to do this, I do not turn it off the vast majority of the time. I was ready to give up, just accept I was one of those guys riding around with his turn signal perpetually on. With the sphere of awareness and this ride problem side by side in my mind, however, I saw something new. When you are about to make a turn, you should be thinking ahead to set up the turn. When you are in the turn, you should not be conciously thinking about the turn but simply doing it (you should be operating at a firmware, not software, level). And when you have ended the turn, you should be thinking about what is going on down the road and doing whatever it is in the here-and-now at that moment. What you should NOT be doing is thinking or doing something related to what you just did, like a completed turn. Ironically the more you shift your awareness to the safety-correct place, the more you remove yourself from remembering to turn off the signal. If this is indeed the correct analysis, what then is the solution to turning off the signal? You could think to turn it off before the turn but that would confuse the drivers behind you. You could turn it off during the turn itself, incorporating it into the behaviors of turn itself. You certainly would not bother trying to remember it after the turn is over and distract yourself from where you are and what’s coming. Sure enough when I focused on incorporating it during the turn itself, I learned to do so in two trials. Perhaps many of you would have realized all this without needing to evoke this convoluted line of reasoning and the Spacetime Sphere of Awareness. For me, however, this helps me pinpoint where the learning a new behavior should be focused. As I continued to ride, I immediately realized how much more could be explored and potentially understood using the Spacetime Sphere of Awareness. We will need to come back to this in a future essay or we will be sidetracked from the rest of the ride. Alas, my reflections on the sphere quickly turned out to be the end of pleasant part of the ride. It was a downhill experience from there into four hours of misery. My ride started at 7:00 am on a decent enough note which included setting up the video camera to shoot footage and stopping for coffee. Having just picked up my jacket liner the day before, I felt set for the 50 degree weather. By 8:00 am, however, I felt a bitting cold cutting through my jacket, jeans and up my legs, and was close to shivering for the next hour. I learned an important lesson about how easy it is to underestimate the weather protection you need once your speed exceeds 45 mph — a liner is only the beginning. The next three hours were followed by a general sense of fatigue and generalized despondence that I’m still not sure what to attribute to: the pounding cold wind for the previous hour, what turned out to be the monotonous 40-50 mph riding punctuated with mind numbing stop-and-go traffic, or the depressing industrial surroundings I found myself in around the outskirts of Tampa (I thought riding around the city would be a better choice than through it and I was wrong). Whatever the reasons and despite making a couple of brief stops to snack and get my morale up, I don’t think I’ve ever had such a long and miserable riding experience. It took me three hours to cover one hundred miles, like watching watching water boil on a stove when you forgot to light the burner. By the time I got to Key Vista Nature Park, I was so dejected I did not even stop. All I wanted to do was sleep, so I found the nearest freeway and got home in ninety minutes. Frustratingly enough, now that I was on my way home, the 70 mph freeway riding and the beauty of the Sunshine Bridge I rode over woke me up and I felt fine when I arrived home: I was genuinely surprised to learn the profound impact on my mind and body by the events of this ride. The majority of this ride was definitively not conducive to eudaimonia. It demonstrates how our surroundings can have an overwhelming impact on achieving our Eudaimonic Self. In fact I am tempted to define a word for this: clastomonia (from the greek root, clasto-, fractured or broken), literally a broken spirit. It is worth reflecting on the Clastomonic Self that gets evoked. It is the opposite of the Eudaimonic Self and I believe can help us identify what objective events interfere with achieving that subjective feeling of a flourishing life (I am referring to a lot more than just being cold or bored by monotonous riding). In fact, this can take us toward a correct understanding the subject/object divide first introduced by Rene Descartes (he got it wrong), and a realization that this divide is really more like a unified breathing tension that has never been divided in the first place. Following what has been 400 years of analyzing human experience into static concepts rather than a fluid process, it is time to return to the process with what we have learned in using this divide over the last few centuries (namely the sciences). This too will be unpacked in the essay alluded to above. For now I think it best to bring this to a close. Consider this post a sort of movie trailer with the movie itself being the essay. I will end with an unexpected hard left turn that just occurred to me: the 1939 iconic film, The Wizard of Oz. 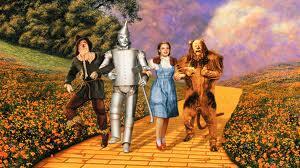 Consider the three characters who accompany Dorothy on her epic journey — the Tin Man, the Scarecrow and the Lion. Each of them believe they lack something critical to being human: a heart, a brain or courage. These can be seen as symbolic of affect, cognition and moral behavior — the three conceptual legs of Cruising Photography & Eudaimonia. It is no coincidence we keep coming back to this trio. It is central to understanding what an experience is and how to lead a flourishing life, so much so it even symbolically makes itself known in The Wizard of Oz. For now I leave to contemplate the new conceptual creatures introduced: the Spacetime Sphere of Awareness, the Clastomonic Self, and the Subject/Object Tension: lions and tigers and bears, oh my!